6 June 2018: Wild horses in the Kosciuszko National Park are trampling the habitat of critically endangered fish and, unchecked, could wipe out an entire species, a University of Canberra researcher has warned. The Stocky Galaxias, a small freshwater fish, is fighting an upstream battle to remain in existence as the small body of water it exists in continues to be damaged by brumbies. The species, which was listed as critically endangered by the New South Wales Government in 2016, is now confined to a single population in a three-kilometre section of a small headwater stream in the Kosciuszko National Park. Stocky Galaxias have previously fallen victim to the predatory brown and rainbow trout, which is responsible for a 98 per cent reduction in the fish’s distribution. But researchers from the University’s Institute for Applied Ecology are becoming increasingly alarmed at the impact brumbies are having on the fish’s habitat. Associate Professor in Freshwater Fisheries Ecology Dr Mark Lintermans, who is leading the study, said without intervention, the species is heading for further trouble. “The decision by the New South Wales Government not to proceed with any lethal culling of wild horses removes the most viable method for quickly reducing the number of horses in sensitive habitats,” Dr Lintermans said. “Brumbies are very abundant in the small catchment where the Stocky Galaxias live, and they are eroding stream banks at their numerous creek crossings. This degradation means that sediment is now smothering the galaxias’ breeding and feeding habitats. “Stocky Galaxias need clean rocky-bottomed streams to breed. They attach their eggs to the underside of rocks, with the eggs taking 30-40 days to hatch in the cold upland environment. University of Canberra Master of Applied Science (Research) student Hugh Allan, who has been studying the species’ ecology since it was listed as critically endangered, said the study has also found that brumbies are impacting streamside vegetation, removing shading of streams and affecting the food supply to the fish. 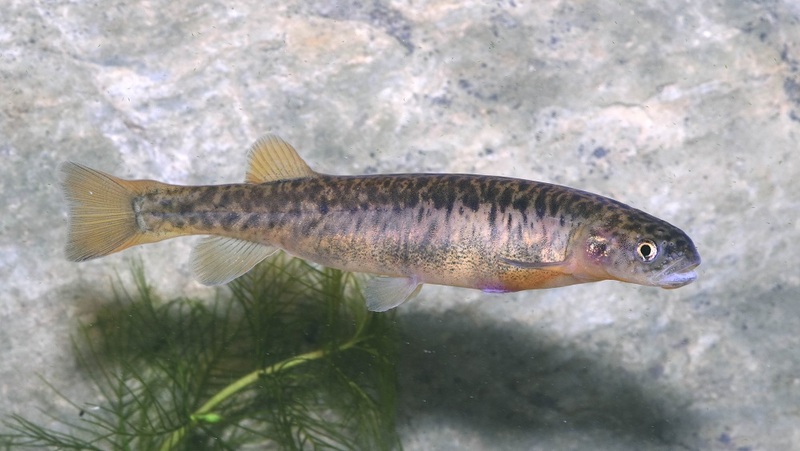 “Streamside and overhanging vegetation is known to be a food source for many freshwater fishes, particularly in small upland streams, and the galaxiids family is no different,” Mr Allan said. Dr Lintermans said Australia’s national parks have an important role to play in protecting native flora and fauna and if non-native animals are threatening natural species, they needed to be adequately controlled. “While replacement measures for culling such as fertility control and the relocation of horses sound good in theory, we need immediate solutions to save our endangered species,” Dr Lintermans said. “Fertility control prevents the continued expansion of horses, but it is a long-term solution, while relocating the animals is made difficult by the sheer number of horses.